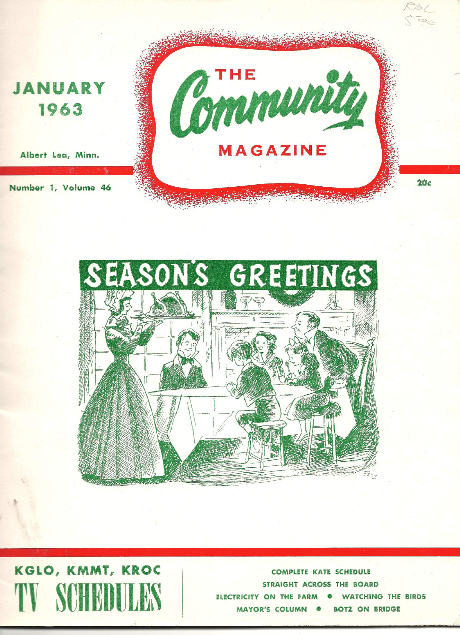 The cover of "The Community Magazine"
Dickensian-styled family at the Christmas table. A few years ago, I wrote several pieces at the other blog about a magazine I’d stumbled upon in an antiques store. It was the kind of magazine I love to look through, because it tells us so much about, as Paul McCartney would say, the world in which we live in. 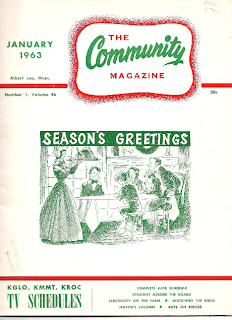 The magazine is called, appropriately enough, "The Community Magazine," and it's from Albert Lea, a town in southern Minnesota. "The Community Magazine" is one of those free magazines you get in supermarkets, and it's about what you'd expect: television listings for the month, a few local columnists and notes, and advertising. Mostly advertising. Which, in this case, is a real treasure trove for the cultural archaeologist. I’m offering a condensed version of those pieces this week. As I’ve said in the past, one of the great treasures of TV Guide is that it shows us how life used to be, and often gives us tantalizing hints as to the shape of things to come. “The Community Magazine” isn’t TV Guide per se, but as a TV Guide substitute it delivers the same payoff. 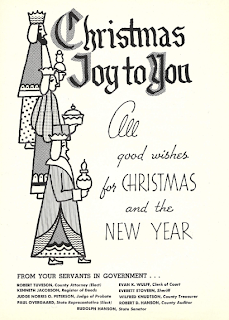 This is the January 1963 issue, which means it would have come out sometime in December 1962, and as such represents the last chance for advertisers to wish their customers the greetings of the season. And herein lies the tale. 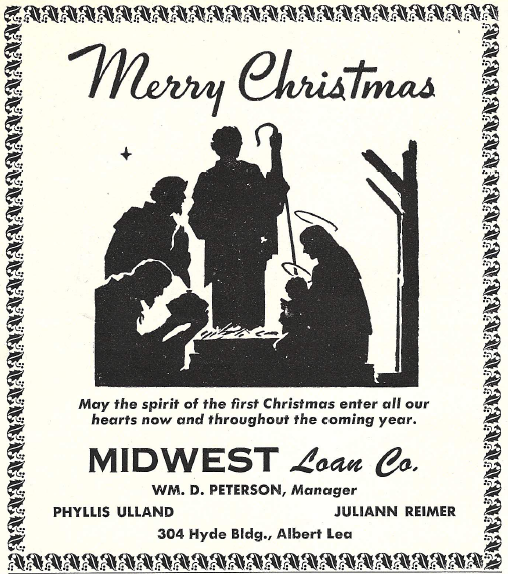 Taken collectively, these ads present a remarkable slice of life from the early 60s: a time when religion was an accepted - no, a necessary - part of the public square, and when the PC police hadn't ridden Christmas out of town in the name of "diversity." 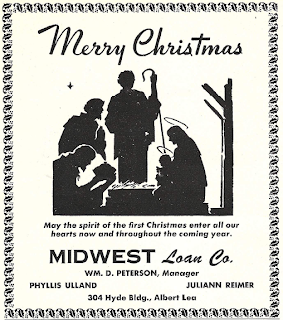 This isn’t to say that the advertisers themselves shared those theological sentiments, but they believed strongly that this was appropriate to the season. And this is the value of television as a cultural mirror - in looking at these ads, just as in watching the shows of the time, we see not just what people of the era believed, but what it was reasonable to expect them to believe. In other words, while things might not have been as idyllic as all that, it was reasonable to think it could have been that way, and that it was something people would recognize and be comfortable with. Granted, we're talking about what might be referred to as "Small-Town America," but no matter how you look at it, it's a real document from a real time, one that sadly seems far away today. ne of the added benefits of combing antique stores in search of TV Guides is that in the meantime you can run into the most fascinating things. This ad is mind-boggling for a couple of reasons. First, it's brought to you by "your servants in government" - that sounds kind of quaint, doesn't it? What's even more stunning is that it not only specifically wishes people "Christmas Joy," but it features the Three Wise Men. Can you imaging a government agency using this kind of symbolism today? Here's another example. Sorenson Lumber is doing more than advertising their business; they're telling you something about the kind of people that run the company. I don't know anything this company (a quick Google search didn't tell me much), but I wouldn't be surprised to find out it was a family business. This ad is from the local Skelly gas station. Werner Wittmer doesn't leave you in any doubt as to what they think Christmas is all about. 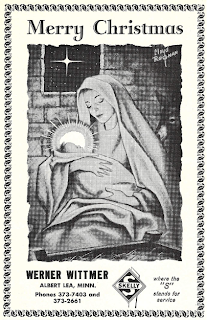 Not every ad in this issue has an explicitly religious motif, but it's hard to look at a candle without thinking of "The Light of the World." 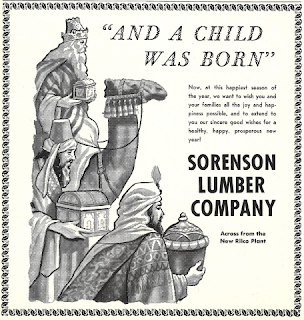 By the way, we don't see candles in Christmas decorating like we used to - when you find them nowadays, it's mostly as part of retro-themed advertising. While I don't share your view that "the PC police have ridden Christmas out of town in the name of diversity"--which implies that people can't celebrate it anymore when they clearly can and do--I agree that these ads are beautiful. For many years I produced dozens of their radio equivalents during the holiday season, when advertisers that didn't spend a dime the rest of the year wanted to send holiday greetings. I wonder how many of these Albert Lea businesses were the same way. Good feedback on the advertising angle. I’ve often wondered what happened to those Albert Lea businesses as well. It’s on my list (even if it’s a wish list) to do some research on that, along with some of the businesses that advertised things such as TVs and appliances in TV Guide during the 60s. As for the PC police, my outlook is certainly colored by having lived for so many years in Minneapolis-St. Paul, aka Sombertown, aka The Place Where Absolutely Nothing Is Allowed. Case or two in point – in St. Paul, red poinsettias were banned from government buildings due to their connotation with the holiday. 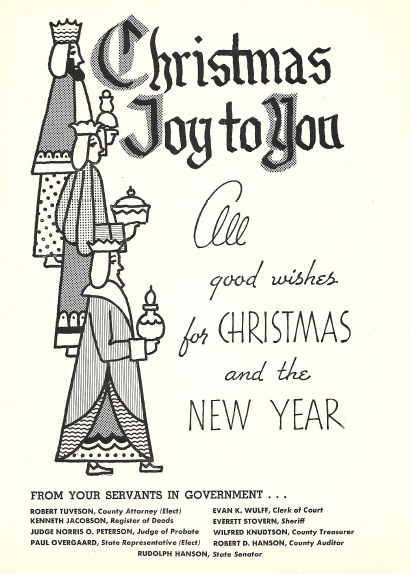 And one of the daily newspapers once ran the banner “Happy Holidays” over the masthead – on Christmas Day. Talk about insensitivity! I would expand or amend my comments to say that the public expression of “Merry Christmas” has been either discouraged or stigmatized to the extent that it is far less prevalent than it used to be. 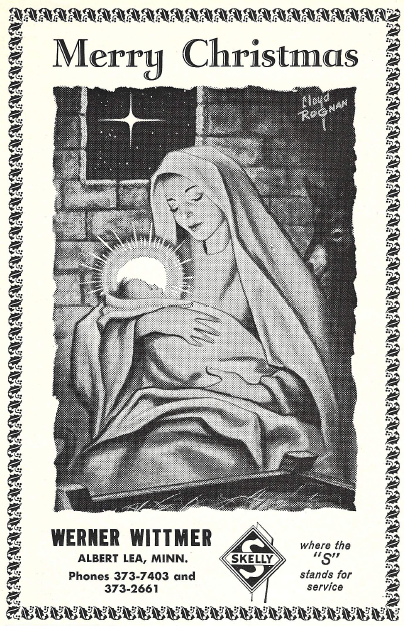 While you are correct that one can still privately celebrate Christmas, I think it important that there at least be a public affirmation of Christmas as such, rather than the ubiquitous “Season’s Greetings” type of mush. Out of sight, out of mind – the less people see Christmas, the less they connect it with its religious meaning, the easier it becomes to replace it with a euphemism. I know people who think that within their lifetimes, Christmas will be marginalized to the point where the phrase is never used, it is no longer a public holiday, the government will officially sanction the term “Winter Festival” or the like, and so on. Alarmist? Perhaps, but the larger cultural point is that 50 years ago, even the thought of such an occurrence, except in a science-fiction dystopia, would have been unthinkable.